In second pAsuram – AzhwAr says “Since there is nothing comparable to azhagar emperumAn‘s beauty, the praises of the worldly people are not going to add more glories to emperumAn and in reality it would only cause insult to his greatness [since his greatness cannot be fully comprehended and glorified]”. Subsequently, AzhwAr mercifully explains the lack of examples for the beauty of emperumAn which is spoken about. In second pAsuram – AzhwAr investigates if there are any examples for azhagar emperumAn‘s beauty; since there no such examples, he says “it is incomparable”. paranjOdhi – Oh supreme light (bhagavAn)! Oh supreme light! when clearly said, lotus flower does not compare to your divine eyes, divine feet and divine hands; the best molten gold that is prepared does not compare to the collective radiance of your divine (spiritual) body/form. Thus, whatever is told in this world as matching example in glorifying you, all of them are mostly explained as seen/understood [by the individuals] will only lead to showing bhagavAn (the object of such examples] in poor light [Lotus flower, gold etc., have acquired greatness; but emperumAn has natural greatness; hence, comparing such objects to bhagavAn will make one think that emperumAn is only as great/beautiful as those examples, but in reality his greatness/beauty is too great]. katturaikkil – One can experience bhagavAn and only be immersed in him and cannot speak about such experience [kattu – experience and uraikkil – if it is possible to explain]. katturaikkil – katturai – a full/single word meaning “if it can be explained”. Even if all of the [best] lotus flowers are compared to your divine eyes, divine feet and divine hands collectively, they are no match. Even individually the eyes, feet and hands cannot be compared to all the lotus flowers. [Why did AzhwAr not sing from the divine feet to hands going upwards as we are suppose to do?] Two explanations – 1) The reason for the order eyes, feet and hands is, eyes which gave the cool [merciful] glance, the divine feet at which we will fall after being won over by him and the hands that will lift us up and embrace us. 2) Since it is said in “na SAsthram naiva cha krama:” (for those with unlimited devotion towards SrIman nArAyaNan, the rules of SAsthram do not apply), AzhwAr is just sharing his divine experiences [which are beyond the ordinary rules of SAsthram] through his pAsurams. 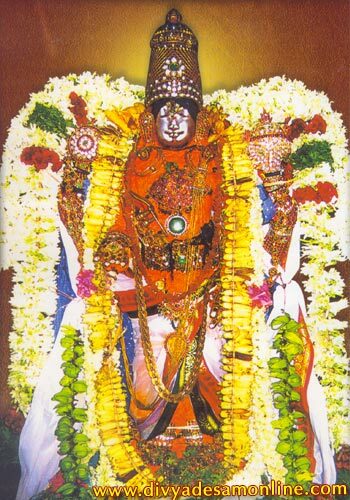 His experiences in previous pAsuram lead to the words in this pAsuram, i.e., “nin kaN” relates to “mudichchOdhi“, “pAdham” relates to “adichchOdhi” and “kai” is a sample of his experience in between the crown and the divine feet. sutturaiththa … – Explains this to highlight that gold is not a match for emperumAn . sutturaiththa – The best gold which was molten and then purified further will not match the radiance of your natural divine form. Only if “gold” was explained with so many adjectives (molten, purified, best), it can at least be discarded as incomparable (without those, we cannot even start comparing the gold with emperumAn‘s radiance). His divine form is explained in manu smruthi 12.122 as “rukmAbham” (having the complexion of molten gold). otturaiththu – ottu – sadhruSam – matching. They (people who compared) explained it as comparable to you. ivvulagu – As said in “manjA: krOSanthi” (bed is making noise), those worldly people who do not understand anything beyond their perception. It is also explained as those people who cannot even comprehend these worldly matters properly. unnai – One who is known from SAsthram alone and even when such SAsthram tries to glorify you, it declares its inability as in thaiththiriya upanishath “yathO vAchO nivarthanthE” (the words are returning from glorifying that brahmam) – such you (emperumAn). patturaiyAy – what is felt in the heart, if said as it is (without thinking through). Alternative explanation – speaking casually without analysing. puRkenRE kAttumAl – it is showing him in poor light only. If he tells something that does not match bhagavAn, how would that show bhagavAn in poor light? If some one who does not know about the structure of gems looks at a precious gem and says “this looks like a salt crystal”, the one who listens to that will believe it as a salt crystal only and due to that the gem will become worthless too. Similarly, any praising done by any one here towards bhagavAn will only lead to such disgrace. What is the basis for the cause of such disgrace? paranjOdhi – As said in nArAyaNa sUktham “nArAyaNa parOjyOthi:” (SrIman nArAyaNan, the supreme light), he is different from all other entities [so, worldly praises will not be able to do justice to his greatness]. This entry was posted in thiruvAimozhi, thiruvAimozhi 3rd centum on July 8, 2016 by Sarathy Thothathri.